Welcome sailing enthusiasts one and all! Whether you are young, of mature age, experienced or a novice there are places for you and friends at Yarra Bay 16ft.Skiff Sailing Club. 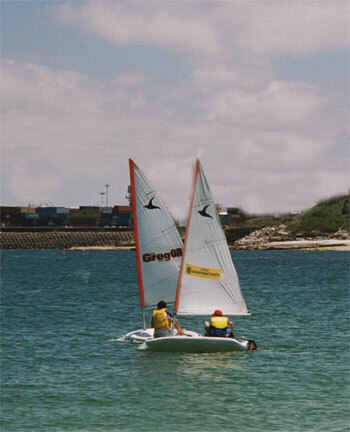 At Yarra Bay the opportunity to learn how to sail awaits those who are interested. The safe Botany Bay location is the perfect scenario for the novice to be taught this fabulous Aussie pastime. The club is located adjacent to a sandy beach at Yarra Road, Phillip Bay. Professional instructors such as Steve Burley are available for tuition throughout the summer season. Learners start with “sky riders” and progress through to “hobby cats” and “sabots”, small 8 to 10 ft sailing skiffs, learning to master these increasingly more difficult craft in readiness for the big time. The sailing club is supported by the tremendous facilities of the adjoining social club. Taken together they provide a wonderful opportunity for young people in particular, to be part of a great Aussie tradition and enjoy one of the many delights of Randwick City’s Sports Coast! The Club is a hidden gem with safe swimming in calm water off the sandy shoreline. Easy parking is available and the location with its adjacent parklands is an altogether delightful site for family outings.